Along with the new 2016 Mazda Miata comes a new spec racing series, and now we know how much it’ll cost to get the car. The Global Mazda MX-5 Cup starts up in 2016, and Mazda Motorsports recently announced that drivers can grab a race-prepped vehicle for an introductory price of $53,000. 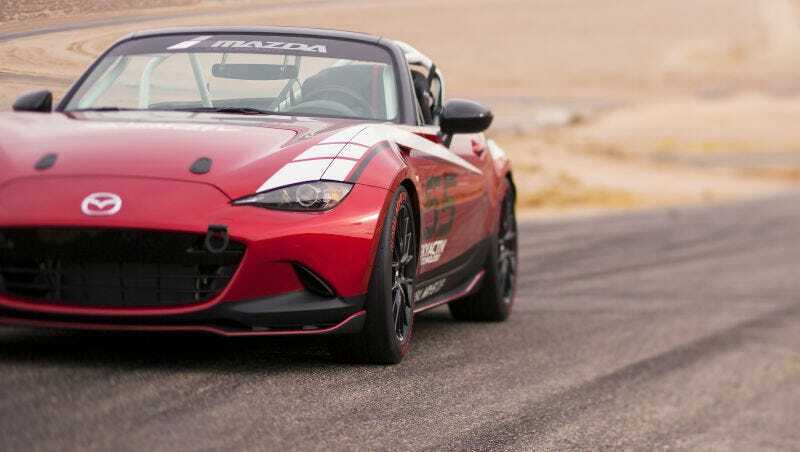 The car will cost nearly $30,000 more than a base street version of the new Miata, and it comes fully equipped and ready to head out to the track — drivers need only bring a racing seat. According to Car And Driver, Mazda said leaving the seat as a separate purchase is due to varying customer preference. In addition to being the star of the new spec series, the car will also be eligible for competition in track-day clubs and both the Sports Car Club of America and National Auto Sport Association. Mazda expects to begin delivery of the cars later this year, with order priority given to current Mazda MX-5 Cup competitors and drivers who have expressed intentions to join the new global racing series. The series is for entry-level professional competition, and will be one of the steps on the Mazda Road to 24. Drivers will head to North America, Europe and Asia in identical race cars, wrapping up the year with a Global Shootout at Mazda Raceway Laguna Seca. The MX-5 Cup series champion earns a $200,000 scholarship to move to a higher level series with Mazda the following year. Additionally, the 2016 Global MX-5 Cup series will culminate with a global finale at Mazda Raceway Laguna Seca in Monterey, Calif., with entrants from around the world to crown a global champion. A one-day test in Mazda’s top-level IMSA Weathertech SportsCar Championship SKYACTIV prototype race car will top the list of prizes bestowed on the global champion. If you’ve got an extra $53,000 lying around and like racing cars, Mazda also released the form for ordering one (or a million — the question of “How many 2016 Mazda MX-5 Cup cars are you ordering?” has an option for open-ended responses). The Mazda website claims that the Long Road Racing shop — joint developer of the new MX-5 Cup race cars — putting the final products together will produce as many cars as there are orders. If you are ordering a million, it seems as if they’ll fulfill that request. And it seems as if you might have to share a few (OK — you won’t have to, but it’s just a friendly suggestion).